The Mountain House Mothers’ Club is a non-profit social club, established in 2004 in Mountain House, CA. 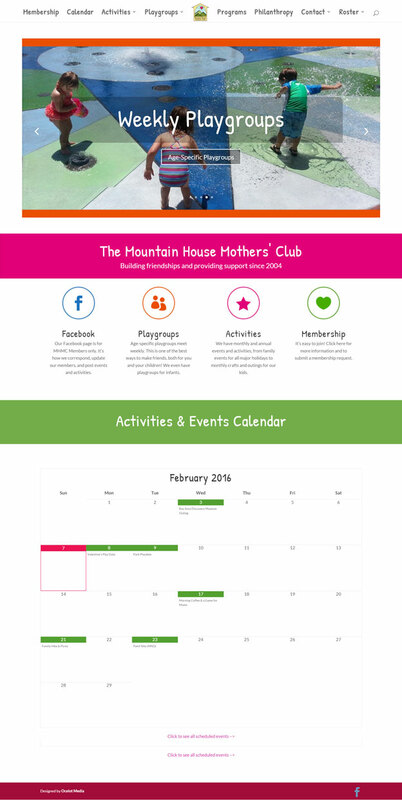 Due to our personal involvement in this amazing club and passion for its mission to nurture the nurturers, we offered to redesign their website in 2016. The prior website was in need of an update and a new method for promotion of the club. Every page now has relevant, updated information. Features not previously available on the website include: easy to use calendar automatically updated from Google Calendar; contact forms for anyone interested in joining the club; form for members to automatically add themselves to club roster; and an option for members to login to access private information for club members. While ensuring that the usability was optimal, we also made sure that the site was clean and user-friendly.